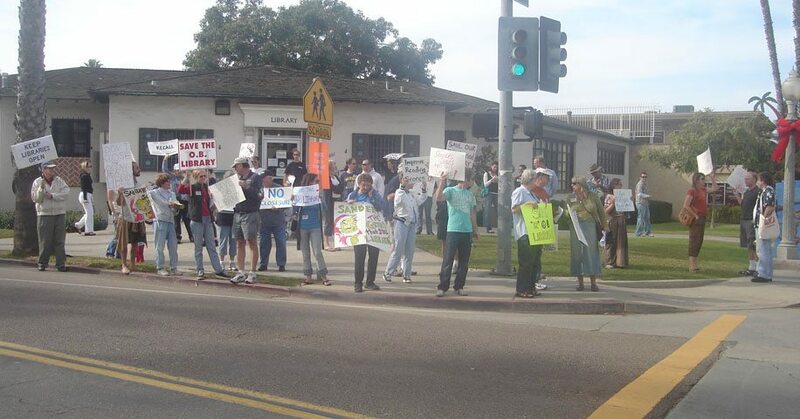 This was the first of 2 rallies held in protest of the OB Library branch's closure in November 2008. This is Nov. 22nd, 2008. Mayor Jerry Sanders said today that he doesn’t expect to suggest closing libraries and park and recreation centers to help close the budget gap for the upcoming fiscal year. A controversial proposal by the mayor this budget year to close the facilities was ultimately rejected by the City Council to help close a $43 million midyear budget gap. He said he’s hopeful that city unions will agree to concessions during to avoid layoffs that will translate into service cuts. “I think we’ll be fine on all of that,” Sanders said. I asked Sanders afterward if he was looking at other ways to cut library costs, such as reducing hours. He said no, that he thought the unions were willing to agree to measures that would avoid service cuts. He said the budget proposal he’s crafting to present to the City Council next month won’t include cuts to libraries. “That’s not what we have in there right now, no,” Sanders said. When I asked if the budget would include cuts to park and recreation, Sanders demurred. “You’ll see the budget on April 15th,” he said. ahem! all you pessimists out there that thought you couldn’t make a diff. take NOTE. DON’T BREAK OUT THE CHAMPAGNE YET! The Mayor said he would not propose closing libraries nor reducing hours. What he did NOT say is that he would not cut staff. This is a significant issue, because the City is currently balancing the general fund budget almost entirely on $9.8 million dollars worth of salary savings. The Mayor imposed a hiring freeze last year and vacancies cannot be filled without approval from Jay Goldstone, Chief Operating Officer. Departments are reluctant to fill these vacancies because the positions may be eliminated in the next budget cycle. Remember- the Mayor has promised to “streamline” government by eliminating City positions and over 800 positions are now gone. “What is the current process and criteria for filling vacant positions? Is the City in a position to fill vacant positions at this time? Should departments wait until sales tax projections are revisited before filling additional positions? Will vacant positions be eliminated in the upcoming budget? Will a hiring freeze remain in effect through the end of the year and continue into 2010? OK- so what does this have to do with libraries? It means there are so many vacancies now that a complete staff restructuring will have to occur to keep your library open and not reduce hours. Are you swimming in staff there? You don’t even have a Youth Services Librarian. Will your branch share a manager with another location? Nobody knows but staffing will not be the same. Why should you care? Last November, when we held rallies at all seven locations slated for closure, our unified message was “No closures, no reduced hours, no staff cuts.” We all felt this message was justified because the library budget has been chronically and disproportionately underfunded for a number of years. Hours had already been cut; the materials budget had already been cut; and 50.75 Full time equivalent staff positions had already been cut largely by the mechanism of eliminating vacant positions. One of the biggest staff losses has been in the Youth Services Librarian category. These are the men and women who work with your neighborhood schools, which often have no on site librarian of their own, and introduce kids to libraries and provide programs that are fun, promote literacy and life long learning. Libraries cannot operate without people to answer your questions, order and process materials, shelve materials and provide library cards, and deliver materials throughout a system with 35 locations. What can you do? Ask the Mayor and your Council member to respond to this issue. The Budget and Finance Committee will review the Mayor’s response to the IBA’s questions on April 1. If you want a glimpse of one part of the FY10 budget, this is where you want to be on April 1. I’ll provide more details on time and location.